When a utility executive questioned why he was contributing to Republican congressional candidates he had never heard of, the answer came back loud and clear: The donations were requested by GOP leaders who were helping the company win an exemption potentially worth billions of dollars. Financially strapped Westar Energy was seeking "a seat at the table" of a House-Senate conference committee on the Bush administration's energy plan last year, according to internal company records spelling out the planned campaign donations. 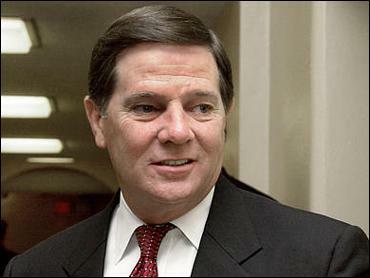 Key Republicans, including House Majority Leader Tom DeLay, denied on Thursday there was any connection between the exemption and donations which amounted to tens of thousands of dollars from the Topeka, Kan., conglomerate and its executives. Surfacing as part of an investigation launched by Westar into the conduct of several of its executives, the documents offer a rare view into a company's efforts to influence Congress. DeLay, House Energy and Commerce Committee Chairman Billy Tauzin, committee member Rep. Joe Barton and Senate Banking Committee Chairman Richard Shelby were needed for their help on the exemption. They had asked that donations be directed, not to their own campaigns, but to those of fellow Republicans in tight races in 2002, according to a pair of e-mails and a memo. In a May 20, 2002, e-mail, a Westar executive asked why he was writing checks to Republican congressional candidates whose names he didn't recognize in amounts far in excess of what he had earlier understood he would have to spend. "Happy to give but earlier … memo had me giving I think $300-400 per candidate. I am confused," the executive wrote. A quick reply came back. "You probably didn't get a copy of the memo sent internal mail on Friday about the current legislative issue in Washington," a Westar executive wrote. "Right now, we have $11,500 in immediate needs for a group of candidates associated with Tom DeLay, Billy Tauzin, Joe Barton and Senator Richard Shelby." The e-mails described Shelby as "our anchor on the Senate side." Among the beneficiaries were a DeLay fund-raising committee that got $25,000; Rep. John Shimkus, R-Ill., who got $1,000 from a Westar executive; and Tom Young, Shelby's former chief of staff whose unsuccessful run for Congress attracted at least $7,200 in Westar executives' donations on May 31, 2002, just 11 days after the e-mail was written. Barton was one of the lawmakers assigned to the House-Senate conference committee that finalized President Bush's energy plan in 2002, and the exemption the congressman introduced would have freed Westar from unwanted regulatory oversight. The provision was a critical component of Westar's plan to split its regulated utility from the rest of its businesses. Having two publicly traded companies might enable Westar to transfer more than $3 billion in debt to the utility. The utility then could try to pass those costs to its customers through rate hikes. That would be made easier if it were exempt from Securities and Exchange Commission oversight, which is what the company sought. Matt Keller, the legislative director of Common Cause, a group tracking money in politics, said "Mr. DeLay and the members of the conference committee ought to be investigated for this. "Once in a while the curtains part in Washington and you find out what goes on behind them. Most people outside the Beltway would look at this and say 'this place is for sale,'" Keller said. Newspapers including The Kansas City Star, the Wichita Eagle and the Lawrence Journal-World have written about the e-mails and the memo. Ken Johnson, a spokesman for Republicans on the House Energy and Commerce Committee, said, "No one on our committee is going to risk going to jail over a campaign contribution. There was never any implied or expressed quid pro quo." "It's presumptuous for someone to think that by contributing to candidates who have challenging elections there's something they'll get in return other than helping a candidate win," DeLay spokesman Stuart Roy said. He said the documents' descriptions were "simply incorrect and inappropriate." Democratic Rep. Ed Markey and House Democratic conferees tried to kill the exemption, but they lost on a straight party-line vote with House members Barton, Tauzin and DeLay favoring the Westar provision. The Senate dropped the provision Westar wanted after revelations a federal grand jury was investigating the company, whose former CEO is under indictment on charges unrelated to the campaign donations. House Republicans also dropped their support for the Westar exemption last fall after being alerted to the investigation by Markey, who called the exemption sought by Westar an "Enron-like loophole." The office of Barton, R-Texas, said he introduced the exemption long before the donations and that "there was no quid pro quo whatsoever." Shelby spokeswoman Andrea Lofye said "Senator Shelby has never supported an exemption for this individual company nor has he made a request for campaign contributions on behalf of Tom Young from this company." Westar CEO David Wittig was indicted last year on charges of conspiracy, money laundering and false bank reports.